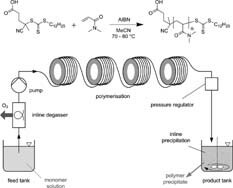 Several unit operations are combined in series to form an integrated, continuous polymerization process; namely inline degassing of monomer stock solution prior to reaction, polymerization using the RAFT approach and precipitation after reaction to form a solid polymeric product. 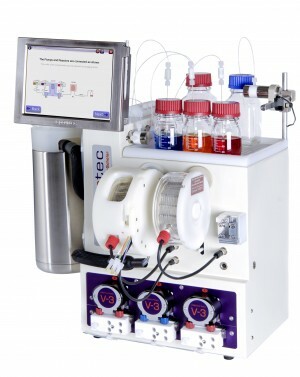 The polymerization is conducted at 70–80 °C with reaction times of 30–90 min in a stainless steel tubular flow reactor, yielding poly(acrylamide) at high conversion (typically >90%) and with a low polydispersity of 1.14–1.23. The axial dispersion occurring inside the tubular flow reactor during polymerization is characterized by reaction profiling using a series of NMR samples. 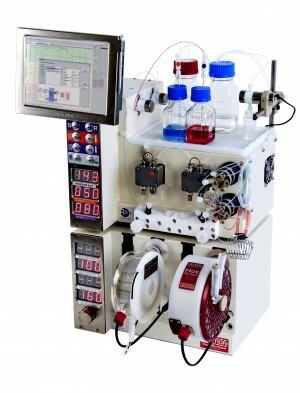 The process can be scaled up to a total output of 1.36 kg of polymer per day on this laboratory-scale reactor.